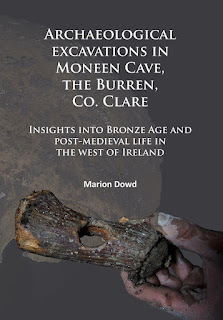 "In 2011, cavers exploring a little-known cave on Moneen Mountain in County Clare in the west of Ireland discovered part of a human skull, pottery and an antler implement. An archaeological excavation followed, leading to the discovery of large quantities of Bronze Age pottery, butchered animal bones and oyster shells. The material suggests that Moneen Cave was visited intermittently as a sacred place in the Bronze Age landscape. 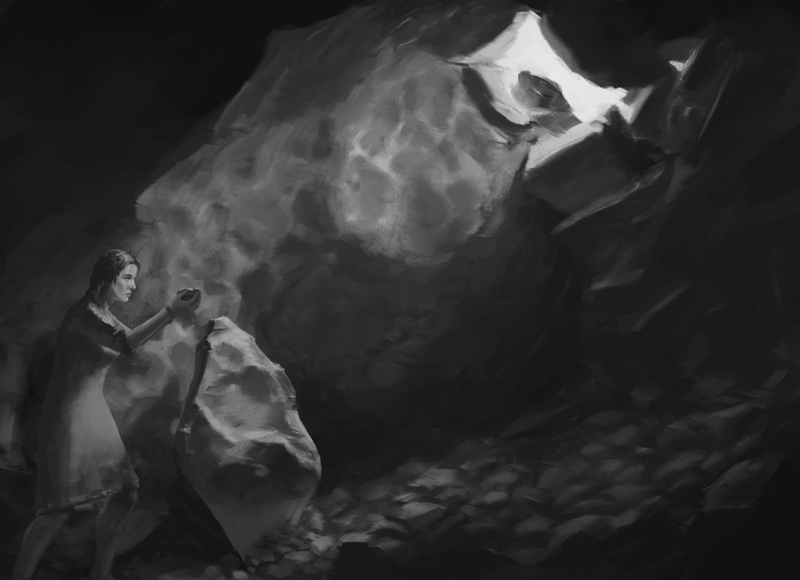 People climbed the mountain, squeezed through the small opening in the cave roof, dropped down into the chamber, and left offerings on a large boulder that dominates the internal space. The excavation also resulted in the recovery of the skeletal remains of an adolescent boy who appears to have died in the cave in the 16th or 17th century. Scientific analyses revealed he had endured periods of malnutrition and ill health, providing insight into the hardships faced by many children in post-medieval Ireland. " 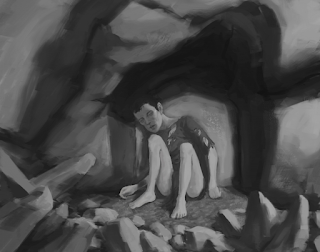 One of the 2 illustrations I did, show the adolescent boy from the 16th/17th century who was found in the cave. He had a head of a normal 14 year old but the body of a younger child because of various periods of malnutrition. It seems he crawled into a hole in the cave to die, an end to probably quite a sad and miserable life. The 16th/17th centuries being such terrible periods of Irish history with the Tudor conquest of Ireland, various rebellions and plantations, you can well imagine the kind of hardship suffered by the normal people in the time. The other illustration shows the Bronze Age activity, which showed signs of being used ritually. It seems either a person or people left offerings ontop of a large boulder inside, which may have been some kind of altar. Here its interpreted as a female shaman of sorts who was doing the ritual depositions and that the offerings were done facing out, rather than inwards. Its probable that someone like this would have done the depositions on behalf on the community and could well have spent days inside communing with whatever spirits or gods etc they had.